Although we live in a fast-paced, plastic-infused world, I know a lot of you want to slow down and live a simpler life. My grandparents lived through the Great Depression, and in this article, I’m going to share some Depression-era strategies handed down from that generation. 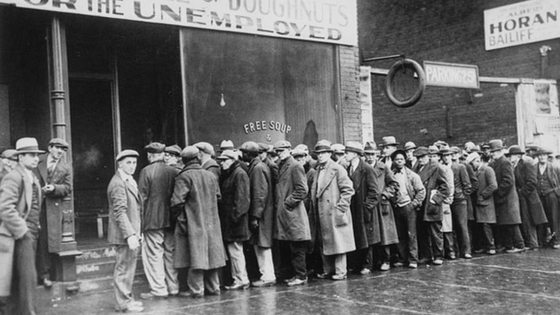 We all know that the Great Depression brought major changes to the US, and it forced the closure of many businesses, left millions of people without jobs, and created crippling poverty worldwide. People were forced to learn to live on tight budgets and in smaller spaces. While it was a harrowing time for Americans, the struggle wasn’t in vain. In fact, it left behind a legacy of triumph in the face of stark adversity and fostered a spirit of survival in many people. I think these tips are a gateway to a simpler life that honors well-made items, and reduces waste. Here are a few of the lessons learned during the Depression that will still hold families in good stead today. Learn how to get the biggest bang for your buck by using everything you pay for. How often do you toss a product because it’s hard to get to the bottom of the jar, tube or container? A variety of rubber spatulas and a pair of scissors will ensure you use up every last bit of product you paid for. How about covering torn or stained furniture instead of replacing it? Or mending clothes or handing them down? Make what you have last as long as possible before throwing it away or replacing it. The Depression Era saw women learn to make dresses from flour sacks and it saw companies meet this need by making flour sacks sturdier and printing them with patterns and colors that became pretty, serviceable clothing and undergarments. This action allowed families to clothe their children and it showed them the compassion of big enterprise to meet the needs of the people they did business with. Growing your own produce is still a smart way to cut costs. Since feeding a family is a major part of everyone’s budget, trimming costs in that areas is just a smart move. Depending on the climate you live in, you even may be able to grow food year-round. You don’t need acres of land or a working farm. Try container gardening, vertical gardening or hydroponic gardening if you live in urban or confined areas. Secondhand stores, pawn shops, and consignment shops abound in the US! You can buy everything from clothes, special occasion apparel and furniture from secondhand and consignment shops. A working lawn mower cuts grass in the same manner whether you purchase it for hundreds of dollars at a big box home improvement store or for pennies on the dollar at a local thrift store. The same is true for kid’s bikes, video game consoles and household appliances. You get the same functionality without breaking the bank. Splitting the cost of living expenses and big dollar purchases that have single uses is an economical treat to your pocket. A riding mower purchased and shared between neighbors makes much better sense than one you purchase but only use occasionally. An apartment in an upscale area with a roommate can yield not only cost savings, but often, a safer, more appealing living space. While the Great Depression forced an economic reality many were unready for, people who were already living frugally tended to fare better. Those who weren’t living below their means learned to do so quickly. Keeping your expenses to a minimum, learning to live within your budget, and implementing the above tips can help you establish lifelong spending habits that will hold you in good stead no matter what your financial situation brings. Which of these tips will you implement immediately? Leave a comment below! My husband & I are on Social Security through being disabled so we’re both young & unprepared for this large cut in income we have learned to implement all of your ideas plus a few more. We raise chickens for our eggs & meat & sell the eggs to help pay for some of the feed,I read your blog for info all the time. We have a bull that we charge to service other Jeffords & 2 Jeffords ourselves that sell the calves or when needed raise & have slaughtered for meat & sale what we don’t need or trade for pork with someone that needs need. When it comes down to surviving you you will hide that the older ways are better! These are awesome ideas. I already use many of these. When I go to the store, I always ask myself, Is this a Need or a Want? Trust me, you’ll spend a lot less if you live by this rule.